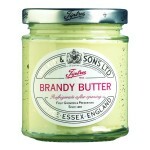 Our most popular brandy butter. Great flavour. 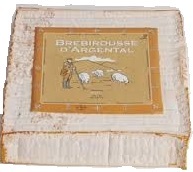 Ingredients: Sugar, Butter (MILK), Brandy (11%). Allergy advice: For allergens, see ingredients in CAPITAL lettering. 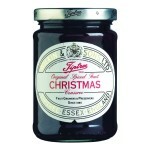 A spiced fruit conserve made with Red Currants, Victoria Plums, Damsons and Sultanas with the addition of some spices. Very popular year on year. Ingredients : Sugar, Fruits (Red Currants, Victoria Plums, Damsons), Sultanas, Spices, Gelling Agent: Citrus Pectin, Acidity Regulator: Sodium Citrate. Prepared with 55g of fruit per 100g. Total sugar content 67g per 100g. 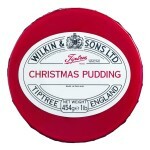 A 112g Christmas pudding. Made with 27% vine fruits, peel, Tawny Marmalade and fortified with cider and brandy. Ingredients : Vine Fruits 27% (Sultanas, Currants, Raisins), Sugar, Breadcrumbs (contains WHEAT), Refined Palm Oil, Cider, WHEAT Flour, EGGS, Citrus Peel, Tawny Orange Marmalade (Sugar, Seville Oranges), Brandy, Mixed Spices, Salt. 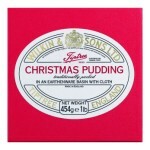 A 1lb (454g) Christmas pudding, traditionally packed in an earthenware bowl with cloth. Made with 27% vine fruits, peel, Tawny Marmalade and fortified with cider and brandy. 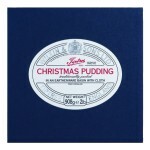 A 1lb (454g) Christmas pudding. Made with 27% vine fruits, peel, Tawny Marmalade and fortified with cider and brandy. Packaged in a plastic tub with lid. Same recipe as 'The Red' but more post friendly. 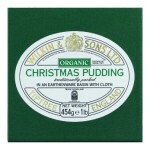 A 1lb (454g) Organic Christmas pudding, traditionally packed in an earthenware bowl with cloth.. Made with 27% vine fruits, peel, Marmalade and fortified with cider and cognac. Ingredients : Vine Fruits 27% (Sultanas, Currants, Raisins), Sugar, Cider, Breadcrumbs (contains WHEAT), Refined Palm Oil, Cognac, EGGS, Orange Marmalade (Sugar, Seville Oranges), WHEAT Flour, Mixed Peel, Mixed Spices, Salt. 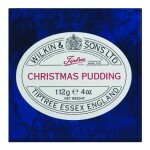 A 2lb (908g) Christmas pudding, traditionally packed in an earthenware bowl with cloth. Made with 27% vine fruits, peel, Tawny Marmalade and fortified with cider and brandy.